Ok. Those aren’t the Telegraph’s words, they belong to Professor Mark Hamer (@ma_hamer)of Loughborough University who is featured in this article in this weekend’s Telegraph (and the Guardian and the BHF website). Which makes them carry even more weight. He researches “Physical activity/sedentary and population health”, in other words what exercise can do for you. The results of the research seem to have been that the benefits of vigorous exercise once a week give almost the same reduction in mortality risk (30%) as people exercising three times a week (35%). That’s right, being a weekend warrior who “goes out hell for leather” at the weekend (or any other day of the week) can make a real difference to your health. Not as much as exercising several times a week, but significant. In all honesty, I only read the article because there was a picture of a mountain biker next to it, but that’s not the point. The point is if you’re looking to get healthier, then getting out once a week and doing something energetic can make a real difference. Backpedalling is here to make that a reality. The Rusty Rides are for people who want to get out and do something energetic, but don’t know where to start. Why sit in the gym breathing conditioned air when you can be exploring the countryside with fresh air in your lungs? No-one ever get out of the front door to “reduce my mortality risk by 30%” but having fun outside can work wonders. It won’t make you into a superhuman athlete but, if the scientists of Loughborough are to be believed, being a weekend warrior could be a life and death decision. Rusty Rides are on Saturday mornings at 9am and 11am. Oh, and knee pads are not necessary, nor is lycra. So, what has the Olympics got to do with real world riding? Nino likes to ride his bike. Nino is a staggeringly capable bike handler. I’d like to be like Nino, but the sad truth is that I am, at best a pale imitation. I’m relatively fit, I’m reasonably capable at handling my bike and I’m definitely not from Switzerland. Jenny likes to ride her bike. Jenny is an insanely gifted technical rider. Jenny is also Olympic Champion. I’d like to be like Jenny, but I know she is far faster, fitter and stronger than I’ll ever be. Nor am I Swedish. Where I am like both Nino and Jenny is that I really enjoy riding my bike. For years I’ve had a thing about “cross-country racing.” It somehow never really lit my fire. It seemed to combine all the least interesting bits of road cycling (weight obsession, ludicrously high fitness level, lack of technical interest) with the worst bits of mountain biking (The best bits of singletrack are no use for races because you can’t overtake and there’s no way of designing a long course that doesn’t have boring bits on it, the best bits of a ride are often the social ones). I’d kind of written it off as flat-barred cyclocross. To sum it up I heard (second hand) someone say of XC racing: “Don’t go looking for the pain. It’ll find you soon enough.” Does that sound like any fun at all? I heard someone say that mountain biking has more in common with surfing than road cycling. There’s some truth in this. That majority of people who ride mountain bikes have little to no interest in racing in the sense of donning lycra and standing on a start line. There’s far less of a club culture with informal groupings of riders being the norm. There’s also far more of an emphasis on exploration and enjoying the kinaesthetic experience rather than going as fast as possible towards a finish line. There’s a reason that XC racing is not a big deal in Britain. So I sat down and watched the Olympic mountain biking more out of a sense of obligation than anticipation. I was expecting flat-backed, lycra clad almost roadies awkwardly doing battle with a farmer’s field that had a few rocks strategically placed in it. Peter Sagan, Tour de France stage winner and current road World Champion had decided to ride the mountain bike instead of the road race because he thought the course suited him better. Doesn’t that say a lot? Something has happened since the last time I watched a cross country race. Something very good. Riders have become more capable. Far more capable. They are no longer stiff-backed road cyclists on the wrong bike. Now they are real, genuine mountain bikers who revel in technical, demanding trails. They’re happy with their bikes in the air, they’re happy with drop-offs, they’re happy with steep rock gardens. They’re riding full-suspension bikes because they’re more capable. This means that the course designers have had to up the level of technical difficulty to engage these riders. When I say “upped” there were several bits of the course where I thought “I’d quite like to take a look at that before ploughing into it”. I certainly would be wary of facing them when I was knackered. The course looked like a red trail centre. For the first time in years I even thought: “I’d like to have a go on that”. In short, it’s turned into something that was recognisable “mountain biking”. These races managed to combine some of the best bits of road riding (the supreme physical effort, the gladiatorial combat at the sharp end) with the best bits of mountain biking (rewarding skill, significant technicality & speed, risk and commitment when taking on features). It was great. I was hooked for the whole race. To answer my original question: it’s got far more to do with real riding than I expected. Having said all that, you’re not going to see me grace the start line of an XC race any time soon. It did, however, inspire me to get out and ride. Here’s a 10% discount code for you. Simply enter “fiverings” on any ride for the rest of the year and you’ll get a discount. You can use it as many times as you want, on as many rides as you want. Here’s a video from the day by one of the teachers: Brett Moran. You can see me hiding at the back in my trademark turquoise shorts. Fortunately for my dignity they didn’t catch the moment where my handstand went very wrong. I’ve now reached the stage in my life where fitness, health, flexibility and recovery don’t come naturally any more. There was a time when what I did off the bike had no impact on what I did on the bike. More importantly, what I did on the bike had no impact on the rest of my life. That is no longer the case. About 8 years ago I reached the age where I “have to look after myself.” Whatever that actually means. Thus, after a few years of my wife badgering me to give it a go, I finally cracked and attended a yoga class. You know what? It was OK. It wasn’t an Epiphany, I didn’t suddenly see the energy threads that tie the universe together and I didn’t feel the urge to suddenly move to Thailand. What I did do was enjoy it. It was simultaneously much easier and much harder than I was expecting. I’m a bloke who rides bikes, such things as tight calves and quads come as standard. On the other hand, so does a reasonable core and a semblance of balance. It was fun. It was just the right level of “challenging”, so I went back the next week. And the next. And now it’s eight years later. I get a lot out of it. I enjoy the company, I enjoy the much slower pace that takes me away from the helter-skelter that is the rest of my life, it challenges me in new and interesting ways. I can feel the difference. I am more flexible, my balance is better, my posture is better and, above all, I am much better at listening to what my body is capable of and respecting that. Often when riding, especially when pushing hard, the limitations of your body are something to be pushed at and to be overcome. 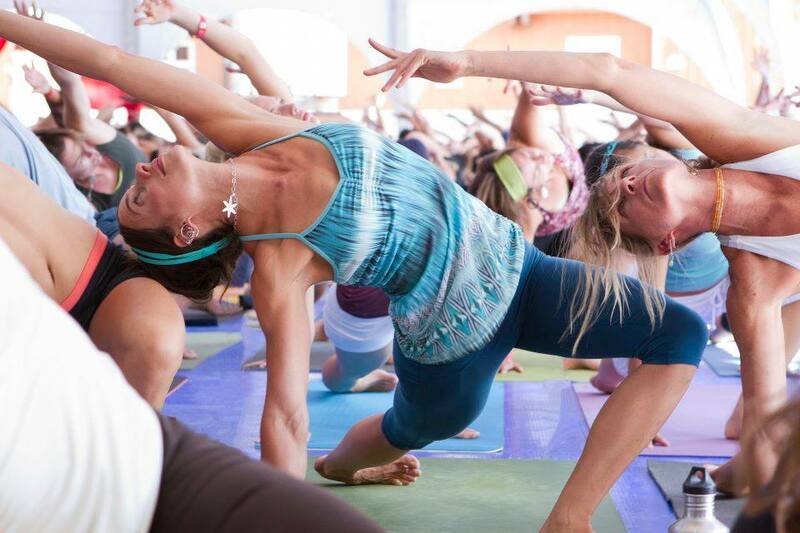 Yoga is the exact opposite of that. The comment above is something I come back to again and again. I find it really helpful. I’ve seen several other blokes (and it is usually fellas) go through the same process as me. Rock up expecting to be brilliant, grunt through the first session without really listening to what’s happening, push yourself to go as deep as possible without listening to your body or what the posture actually is, get miffed that it’s hard and all these ladies seem to find it easy, then either get disheartened or accept the situation for what it is and come back. Thanks to Lorna for putting up with me as I went through that process. I’d recommend it to everyone. You really don’t need to be a hippy to enjoy it. It will be harder and more physical than you’re expecting, it will also be easier. If you accept it for what it is. 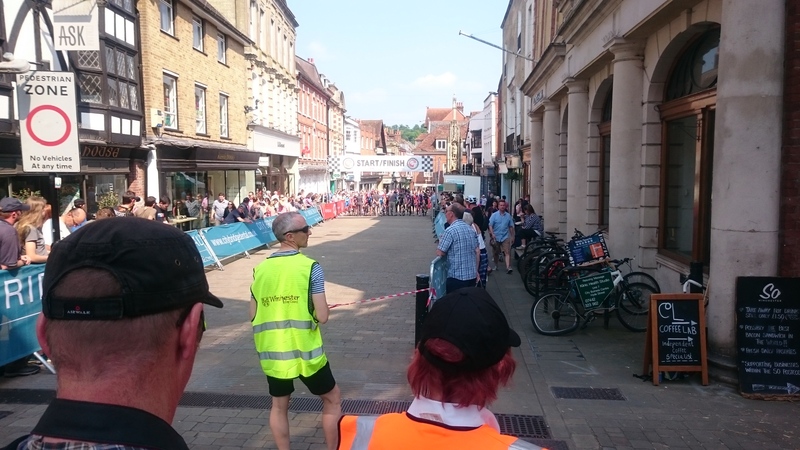 Yesterday I went to the Winchester Cycle Fest and Criterium. Yesterday I saw one of the most epic and impressive sporting performances it has been my good luck to see live in a very long time. For those who aren’t entirely sure what Criterium (crit) racing is, it’s a bicycle race round a short, twisty, urban circuit. The aim is to go as fast as possible for a set amount of time without crashing, riding into someone else, puncturing, running out of gas or just being passed by people who are faster than you. First person over the line at the end wins. Simple really. The only time I tried it, I felt like someone had poured hot, broken glass into my lungs. It was horrible and brutal. Yesterday I saw someone make it look, not easy, but certainly made it look like everyone else was doing something much more difficult. Pfeiffer Georgi turned up to race the under 16 girls region championships. She completely wiped the floor with everyone else. She spent 25 minutes going absolutely flat out. She went faster virtually every lap than everyone else taking part. It was hugely impressive to watch, but not the thing that was memorable. About an hour later she lined up for the Elite adult championships against the best circuit riders in the south. All of these adults were fresh and Pfeiffer had ridden a race, it was a long way from a level playing field. She proceeded to show them exactly the same clean pair of heels she had shown the 16 year olds. This time she did it for 45 minutes. To say they were out of sight doesn’t really do it justice. Even when she had the race won, she kept pushing and getting further in front. It was jaw dropping. Remember this name: Pfeiffer Georgi she is a star in the making. From here they became slightly circular. However, they really made me think. Both conversations were with women who were thinking about taking part in one of my Get into Mountain Biking rides, but were being put off by perceptions of how fit I am. I was confused to say the least: these rides are designed for people who have never (or almost never) ridden a mountain bike before, so how could you not be fit enough? 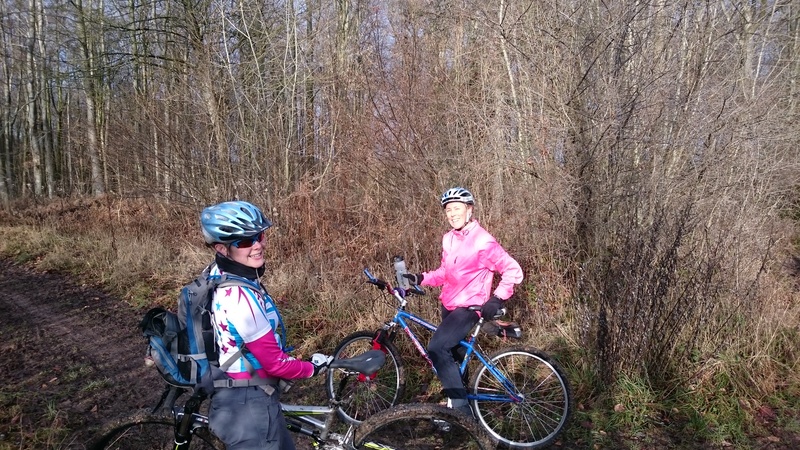 You are fit enough to take part because the Get Into Mountain Biking rides are a fun introduction based on the fitness and ability of those taking part. The ride is based on your fitness so you must be fit enough because you only need to keep up with yourself. The length will be determined by your fitness and the difficulty by your ability. I’m offering these rides because I want people to share my love of riding mountain bikes. I’ve designed them so that they’re fun whatever speed we’re going at. They’re about meeting people and having a great time on two wheels. I’m going to enjoy myself because I get to ride my bike, which I love. Notice how fitness, speed, difficulty didn’t come into that statement? That’s because they’re irrelevant. I want you to have fun because, if you don’t then I’m not doing my job properly. If you hate it, then you’ll never come back. If you love it, you will. It’s in my interests for you to enjoy yourself as well as meaning there are more people riding bikes, so I promise that I will look after you. However, I can see where both people were coming from: they’d seen pictures of me with my bike and I look fit. I’m a professional mountain bike leader, being fit and healthy is a matter of professional pride and discipline. 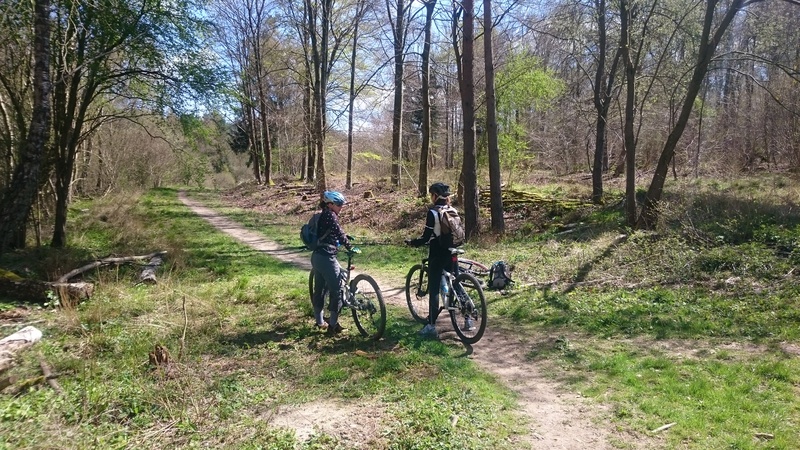 The Mountain Bike Leader qualification is pretty exacting and the standard is pretty high, so I need a certain amount of fitness to meet those standards. Also, it is a matter of professional standards to be fit enough to lead every ride I offer without running out of gas, and some of them are quite long. I am in fairly good shape because I need to be. I have also reached an age where this doesn’t happen by accident, it’s the result of fairly hard work. I can see how, to someone contemplating going for their first ride, that looks pretty intimidating. Believe it or not, I know how you feel. When I turned up for my leader training the chap leading the course looked fit as a butcher’s dog and I thought to myself “Am I in good enough shape for this? Am I going to be able to keep up?”. When I started riding mountain bikes I was much less fit than I am now and struggled to keep up with the (admittedly quite fast) group I joined, but they looked after me. Don’t get me wrong, I enjoy riding fast. I enjoy going out with my friends pushing each other to go as fast as we can, coming home knackered. I enjoy going to new places and pitting myself against terrain I’m not sure I can ride. I enjoy getting to the top of a hill before my friends or getting the bottom sharing stories of how fast we went. It’s a lot of fun. In my own time, with my friends. But it’s not the only reason I ride. And it’s definitely not the reason I’m doing these rides. Every day I go out on my bike is a good day. It’s a very good day if I can share that with other people. It’s an even better day if they can share it with me. That’s why I’m doing this. That’s why everyone is fit enough to go on a ride with me. Come on a Get into Mountain Biking Ride to find out.